Our goal is to provide our customers with the most consistent, high-quality, certified organic soybean meal on the market today. Proprietary and specific heat processing system assures a finished soy protein with high digestibility. Our customers don’t have to worry about an inefficient protein source when compared to improperly processed soybeans or other protein source by-products. 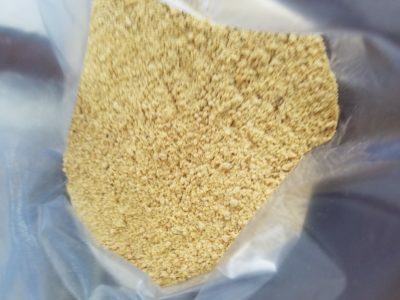 Organic Soybean Meal is used in the production of organic poultry feed, swine, dairy, cattle, aqua feed and other types of feeds applications. Energy and Protein in one ingredient. Our unique cooking system breaks cell walls in soybeans to destroy anti-nutritional factors, increases protein and fat digestion efficiency, modifies complex carbohydrates, and reduces viscosity in the intestine. It produces a highly digestible and palatable product. The careful process increases the percentage of Rumen Bypass Protein (RBP) for ruminants. 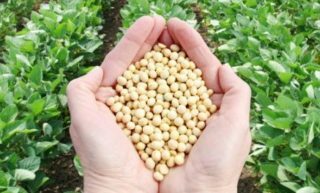 Our organic soybean meal contains less than 6% moisture. Also contains tocopherol and lecithin, important for protection from oxidation and increasing fat digestibility. When we use the word Organic it clearly defines that no chemicals, boiler steam or other non-organic methods are used during the process. Equally important are the raw materials used; must also be organic. Beans are sourced from local organic certified farmers. All incoming raw materials are inspected and tested for quality. 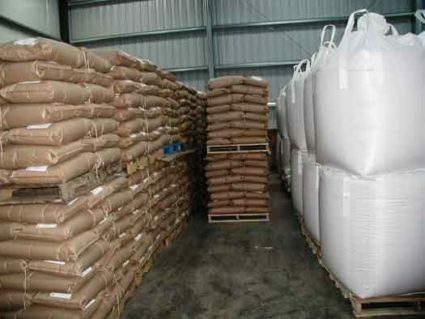 Once we are satisfied with the quality of the soybeans and only then materials are unloaded and carefully stored. Quality control also plays a big role during the complete manufacturing process. Our Plant has the latest technology, robust quality control, and high degree of automation. The first process is cleaning of soybeans by highly advanced Reel Machines. During this process most of the impurities like sand, stone particles are removed. Split soybeans and weeds are completely eliminated. Now the soybeans are free from above mentioned impurities, but to ensure high quality, soybeans pass thru the d-stoner machines. During this process even the smallest sand particles get eliminated. Soybeans are then transferred to high power Megna Rolls (also known as Perma Roll Magnetic Separators). During this process all metal particles are removed. The cleaned soybeans are then crushed in highly advanced extruders. Soybeans are crushed at high temperatures. Temperatures can be controlled according to buyer requirements. In this process, soybeans get converted into a paste form. This paste is then passed through expellers. Oil is expelled and paste from soybeans gets converted into d-oiled cake. D-oiled cakes, then passed through hammer machine to achieve the required mesh size powder or meal. (Mesh size can be provided according to buyer’s requirements.) Meal then passes through a cooling process to achieve room temperature. The soybean meal is stored in grain silos and in bags ready to ship to customers worldwide. PACKING: Bulk in containers / 25 Kg / 50 Kg. and 1,000 Kg. Jumbo bags. Direct source (no intermediaries) best price and high quality. Adjustability of Quality according to buyer requirement. Experience – Over 25 years of manufacturing and QC experience. Customer oriented – As a family and employee-owned company we all have an interest in your satisfaction. We work every day to deliver value and quality. We simply are not satisfied until you are.